Whether or not he’s fully healthy and ready to be a difference maker remains to be seen, but Aaron Judge is back in the New York Yankees lineup. 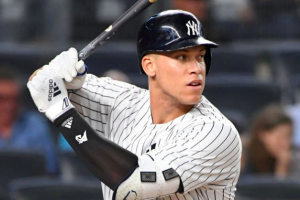 For the first time since suffering a broken wrist in late July, Judge was in New York’s lineup Tuesday night, batting second and playing right field. He went 0-4, as the Yankees beat the Red Sox to avoid being eliminated from the AL East race. Judge was officially activated from the DL last week but limited to two innings as a defensive replacement until he was cleared to face live hitting. After participating in simulated games, the Yankees finally cleared him for full game action on Tuesday. Of course, Judge did his best to push the Yankees in the right direction. At the time of his injury, the Yankees expected Judge to miss three weeks. However, that turned into a roughly eight-week absence, which didn’t make it any easier for the Yankees to keep pace with the Red Sox. He admits that he still has some pain from the broken wrist, but Judge intends to play through any discomfort he feels moving forward. The question now becomes how quickly Judge can find his timing and rhythm at the plate. At the end of July, he was hitting .285 with 26 home runs. He was undoubtedly one of the team’s most impactful players. With the Yankees heading for a one-game Wild Card Playoff, they need Judge to get back on track as soon as possible. The Yankees have 12 games left in the regular season for Judge to get back to the level he was at before the injury. There’s no denying that the Yankees have stumbled while Judge has been out. Even if he doesn’t hit the ground running, there is hope that his presence in the lineup can help the Yankees kick things into gear and start playing better baseball heading into October.